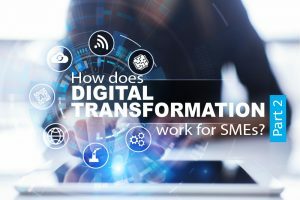 In part one of our blog ‘How does Digital Transformation work for SMEs’, we looked at how and why SMEs should embrace new technology to enable them to challenge the bigger players, disrupt traditional markets and compete on a level playing field. We also found, in our experience, that the areas in a business that create and manage vast amounts of paperwork, such as admin, accounts and HR, are ripe for transformation, and explained how a Document Management solution can help businesses take control of their paperwork and comply with the GDPR. In part 2, we’ll continue to look at some common business problems and how digital transformation can help to solve them. Reviewing your supplier invoice approval and payment processes can be a real eye opener. Do you know how long it takes your business to approve an invoice? How many steps are there in the process? How accurate is your manual data entry? How much time is spent chasing managers for approval? Is sensitive financial information stored securely and compliantly? If you frequently pay invoices late, not only are you damaging your supplier relationships, you are also missing out on prompt payment discounts. SOLUTION: An Accounts Payable solution. With an automated Accounts Payable solution, data is captured from paper and electronic (pdf) invoices, recognised, interpreted and processed with little or no intervention. A process that can take multiple time-consuming steps from receipt of an invoice to approval and payment, can be completed in a matter of seconds. Reducing manual data entry and checking not only saves the Accounts team time, but also increases efficiency. Instead of dealing with every single invoice, you can just deal with the exceptions. Nobody likes Expense Claims. Submitting and approving them is equally as frustrating for claimants and the accounts team. The challenges for claimants include not submitting their expense claims on time, losing receipts, submitting damaged receipts and not understanding the company expense policy properly. The challenges for the accounts team include wasting time chasing employees for their claims, chasing managers for approval, lots of manual data entry, double checking all receipts and forms, detecting duplicate and fraudulent claims, and keeping an accurate and up-to-date paper trail. reimburse employees quickly. Using paper based processes also makes it difficult to gain an accurate picture of exactly what is being spent and where. SOLUTION: An Automated Expense Claims solution & mobile app. An Expense Claims solution & Mobile app automates and streamlines the complete Expense Management process. Employees can take photos of their receipts using the app on their phone. Once uploaded to their account, they can quickly create their expense claims and submit to the accounts department online. This saves lots of time and they don’t need to keep piles of paper receipts. The accounts team can review and send for approval. Managers can approve, even when they are out of the office, on any web enabled device, reducing delays and the time taken to reimburse employees. The solution is pre-programmed to enforce your companies Expense Policy making to easier for users to comply. It is also fully compliant with industry and HMRC regulations too. PROBLEM 4: What is your data trying to tell you? In a world where we’re surrounded by data, businesses should be thinking about what they are doing with theirs. Do you store data from multiple sources? Is your data stored in a format that is easy to work with? Can you quickly and easily produce the reports that you need? Is your data in real time? Business Intelligence software allows you to easily prepare, analyse and explore growing data from multiple sources in real time. It simplifies every step of the analytics process taking complex data and instantly creating insights that drive your business and inform your decisions. Users can view and explore their data via an interactive dashboard, create reports in minutes and share with colleagues. So, if you’re ready to take the first step on the journey to Digital Transformation, let’s talk and see if we can help you to keep on doing what you do, only better.